The paradox of Georgia’s political system is that an oligarch controls the government by staying out of it. Presidential elections are scheduled for this fall in Georgia, and many expect that behind-the-scenes ruler Bidzina Ivanishvili is using the vote to install a loyalist in the only major office not beholden to him. The last time Ivanishvili, the billionaire head of the ruling Georgian Dream party, nominated a president, it did not work out as he had hoped. Current President Giorgi Margvelashvili is an academic with whom Ivanishvili used to enjoy gabbing about philosophy. But since becoming president in 2013, Margvelashvili has proved to be his own man rather than one of the many loyal, expendable figures who have been filling top government jobs in recent years. Margvelashvili has openly defied Ivanishvili, criticized him for his shadow rule, and even refused to move into the presidential residence that Georgian Dream took pains to prepare for him. “I consider Margvelashvili my biggest mistake in politics,” Ivanishvili once confessed. Having learned his lesson, now Ivanishvili appears to be running a cattle call for a candidate who is more malleable, but still has the public stature appropriate for the job. Based on media leaks and analysts' speculations, Ivanishvili’s pick could be Health Minister Davit Sergeenko, whom polls rank as the most popular government official, or the former Minister for Internally Displaced Persons Sozar Subari. Or, peut-être, it could be the French-born and French-accented ex-Foreign Minister Salome Zourabichvili-Kashia. She is the only independent member of the Georgian Dream-dominated parliament, though she is still a well-known party sympathizer. Some even speculate that Ivanishvili’s candidate may be the one person he fully trusts – himself. Friends and foes alike believe that could be a savvy move. “Mister Bidzina [Ivanishvili] would be the best candidate for us,” said Parliament Speaker Irakli Kobakhidze; other Georgian Dream members have echoed that sentiment. Critics say that running for the presidency would offer Ivanishvili a chance to stop hiding in plain sight as the real ruler of Georgia and step into the world of open politics, where leaders are elected and held accountable. “By taking part in the election, he would restore his legitimacy,” political analyst Gia Khukhashvili told Prime Time News. Others are skeptical. “He is not going to do it,” Kornely Kakachia, the director of the Georgian Institute of Politics, told Eurasianet. “Ivanishvili is now in a comfortable place, where he does not have to worry about quotidian political matters, shake hands with political leaders or face direct criticism for any political issues. When faced with a crisis, he can sacrifice the heads of government while he remains more or less unscathed and can stick to digging up trees,” Kakachia said, referencing to Ivanishvili's peculiar, controversial hobby. Ivanishvili served as prime minister for about a year before stepping aside in November 2013. Since then he has maintained an informal influence on politics via loyalists installed across the government. He returned to a formal political role this year, taking over as chairman of Georgian Dream in an apparent attempt to tamp down infighting over the party's presidential candidate. The new president will be Georgia's fifth, but the powers of the presidency have been reduced to an essentially titular status. 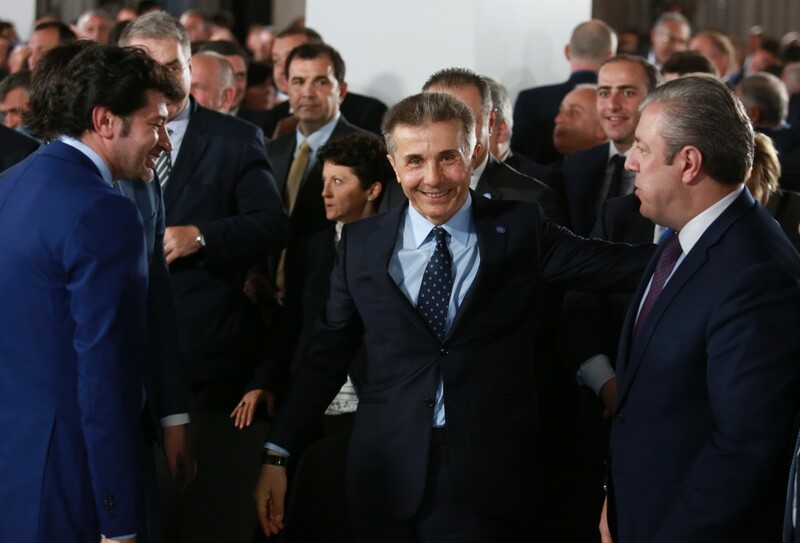 The prime minister is nominally the top post in the country, but most prime ministers of late have come and gone, spending much of their time in office praising Ivanishvili. Georgia's last prime minister, Giorgi Kvirikashvili, quit in June, citing disagreements with Ivanishvili. The nature of those disagreements was unclear, given that Kvirikashvili had been praising and thanking Ivanishvili up until that point. Kvirikashvili’s replacement, the previously little-known 36-year-old ex-Finance Minister Mamuka Bakhtadze, was appointed out of blue, as far as much of Georgia is concerned. Against this backdrop, the presidential election has, at the very least, a symbolic importance, said Luis Navarro, a longtime Georgia observer. “Will Bidzina Ivanishvili capture the last institutional holdout against total conformity to his Georgian Dream?” asked Navarro, former director of the Georgia office of the U.S.-funded National Democratic Institute (NDI). Margvelashvili, too, could be running for his second term, but he has been hedging his bets. “I’m waiting to see what they [the Georgian Dream] are going to do,” he has said. If the maverick Margvelashvili gets reelected, the next question will be if his supporters can coalesce into a third force, ahead of parliamentary elections in 2020, that is a viable alternative to both Georgian Dream and the United National Movement, Navarro said. But while Margvelashvili has gained some respect among Georgia's civil society and intelligentsia for his principled positions, his public approval rating is only about 26 percent, according to NDI polling. If he runs, Margvelashvili may end up splitting the opposition vote, which would improve the chances of Ivanishvili’s candidate, said Kakachia of the Georgian Institute of Politics.